Here’s a question for you...where does your business appear in search engine results? First page? Second page? Even further back? The fact of the matter is, where your business lands in search engine results matters, quite a bit in fact. The closer you are to the top of the first page, the more likely your potential customers are to click. It highlights the click through rate of website results based on specific intent. So, for instance, if someone is performing a search based on a specific location, approximately 35% of people will click on the first result. From there, the numbers drop significantly. If your business happens to be on the second page of the search engine results then the click through rate to your site is going to be a dismal 5%. So what can you do? No doubt you’ve heard about SEO (search engine optimization), but chances are you’ve just been too busy actually running your business to really dive deep into it. Plus, it seems pretty complicated. Can a local business owner really tackle this? In fact, if you want to learn how to easily optimize your site, get your SEO skills up and running, improve your website search result rankings, and get more customers from it, then keep reading. The first thing you need to do to get started is make sure your local listings are set up. This is one of the keys to be found in local searches. Here, you really want to go above and beyond when it comes to information. Include more than just the basics like your business name, contact information, and hours. Include keywords and an introduction on what your business does, point your location out on a map, even include social media information, photos and videos. The more information the better, it will all help you get found by your customers online. Convinced of how important reviews are yet? If you still need convicing then just check the results in Google for your local area. Which businesses tend to appear at the top? Can you spot a trend? You got it -- it's generally the sites that have the most Google reviews. Now, there are a couple of ways to go about getting reviews for your business. First, simply ask. Get into the habit of asking customers to leave reviews online. Start with your most frequent, favorite, or best customers. Remember, this strategy is one that is going to be much more long term. Don’t run around trying to build up reviews overnight, instead, focus on steadily adding a few every week. Over time, all those positive reviews will both help to improve your ranking, and will spread your brand’s name via word of mouth. In essence, Name, Address, and Phone citations (called NAP Citations) for short, are basically just places online where your business is listed. This is a big area that you do not want to ignore because it can reap huge benefits for you down the line. The biggest reason for having as many NAP Citations as possible is because for every site your business is listed on, it counts as a backlink that points back to your website. Backlinks are incredibly important for search engine results. So, if you’re operating in a competitive space like a pizza shop, for example, having your business consistently adding NAP Citations monthly can help make you stand out from all the other pizza shops in your local area. Search your local area and country on a regular basis for more sites where you can add NAP Citations and keep doing it on a monthly basis. Just as with NAP Citations, you also want to include your business in as many industry directories as possible as well. If you aren’t sure exactly what directories to be in, start by looking up a few of your competitors. Having a lot of really high quality content is also a great way to improve your SEO rankings and search engine results. It doesn’t matter what type of business you’re in, every brand can benefit from having a blog up and running on their site. It’s the perfect way to start providing your potential customers with a lot of value. And that’s to just get started, when it comes to blogging, there are endless possibilities if you can get a little creative. Search engines always prefer sites with quality content that are updated on a frequent basis, do that and you’ll be in very good shape. Remember, the goal of a blog is to drive traffic to your website, build your authority, and increase conversions, that is turn potential customers into actual customers. Do that by showering your website visitors with tons of useful, engaging, and valuable information. Write interesting posts that are at least 500 words (that's the minimum - ideally 750 to 1000 words), include video links and other social media as well, highlight your products, services and happy customers. And, be sure to optimize each post for best success (keep reading to find out how). Some of the quickest and easiest wins when it comes to SEO can be achieved just by taking a bit of time to optimize your website. This doesn’t mean some sort of big overhaul, in fact, you’d be surprised to find out just how many businesses skip this step and then wonder why they are stuck at the bottom of page two of the search results. Don’t let this be you! Even taking care of the simplest of things can give you a leg up. Those are the basics, and even just taking care of those will help improve your rankings over both the long term and the short term. Remember, any additional content you include on your site, be it a blog post or a new service, you want to be sure it is optimized. Lastly, when it comes to optimization, don’t forget both speed and security. The majority of people who visit a site will leave if it doesn’t load quickly, and that’s for both desktop and mobile devices. Run a speedtest to see how quickly your site loads, and if it feels like it’s lagging, consider upgrading to super fast SSD hosting. Hand in hand with speed comes security as well, especially if your customers can buy on your site, you want to be 100% sure it is secure, which is one way to really build more trust with your customers. Consider upgrading your current site to HTTPS so that your entire site becomes completely secure. You'll need an SSL Certificate for this. But don't think this is just for eCommerce sites that accept payments. HTTPS is a stated Google ranking factor so it can give you can futireproof your website and get an advantage over the competition. 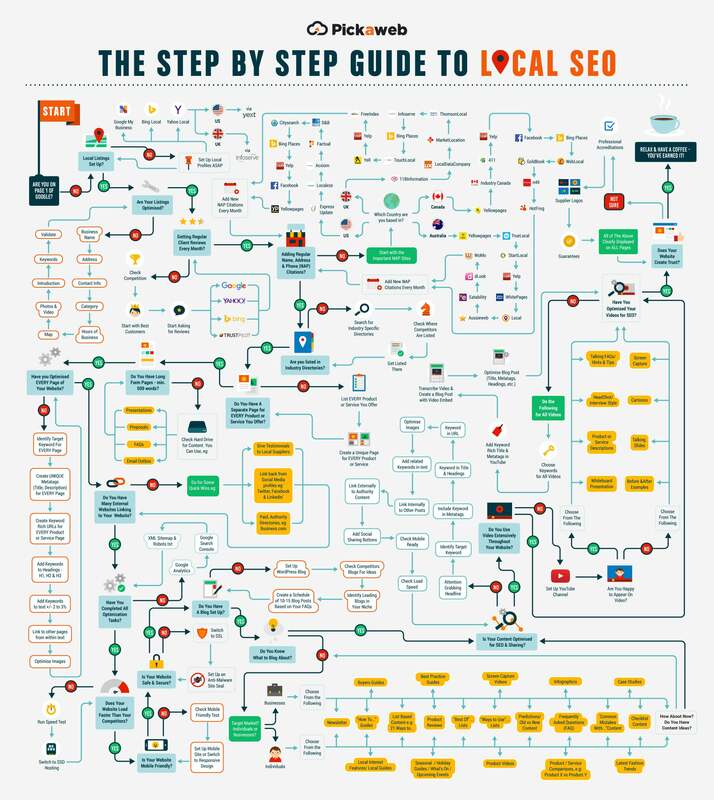 By now, you should have a very good idea of what you need to do in order to get your site up to scratch and optimized to get the best local SEO results. Start with the basics like local listings and make sure you start picking up reviews. Get regular NAP Citations and create more content on your website. Make sure that you get the SEO basics right like optimizing every page and consider upgrading to superfast hosting and securiing your site with an SSL certificate to make it HTTPS. If you follow each of the steps you see in the cheatsheet, you’re going to be be well on your way to higher rankings and more happy customers -- a perfect combination.